Product code: ES7767 Categories: Sold Items, Sold Rings. Here is a very beautiful and unique Art Deco square shaped diamond cluster engagement ring that is sure to always be loved and admired. 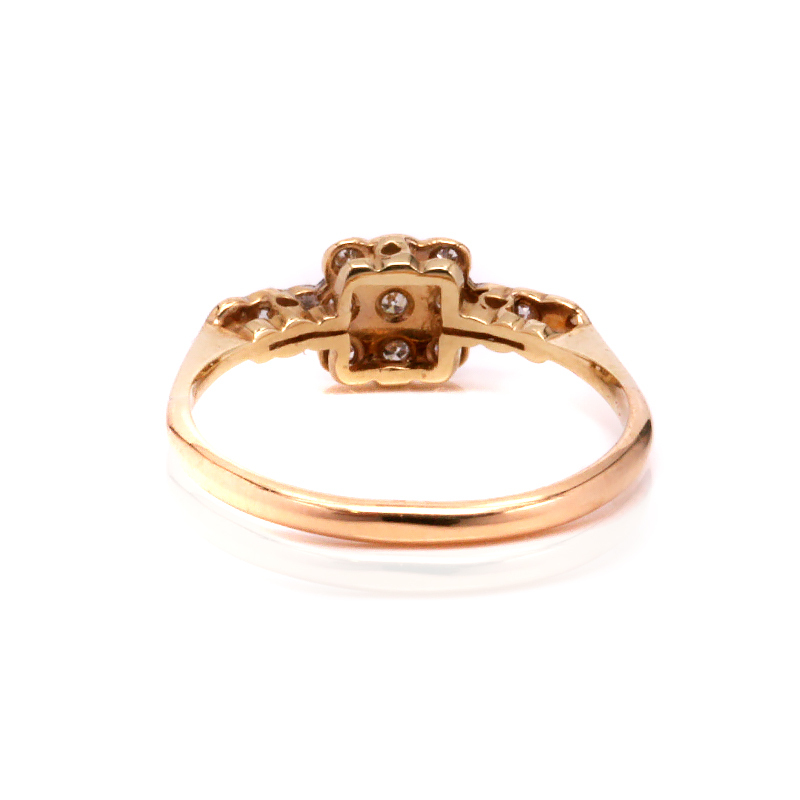 Hand made in 18ct yellow gold and platinum in the 1920’s, the wonderful way that the traditional diamond cluster ring is taken then made into a square design really makes this such a stand out feature of this ring. In the centre is one diamond which is then surrounded by eight more. And looking will reveal the most beautiful millgrain setting which can be seen as the elegant crimping along the edge of the setting. Millgrain setting was very popular during the Art Deco period and shows the level of attention that went into hand making this ring. With a further diamond set onto each shoulder, even the detail where these diamonds are set is just so incredible to see. The diamonds total 0.06 carats and the top of the ring measuring 6.7mm in diameter, from one diamond on the shoulder, across to the other, this distance measures 17mm across. 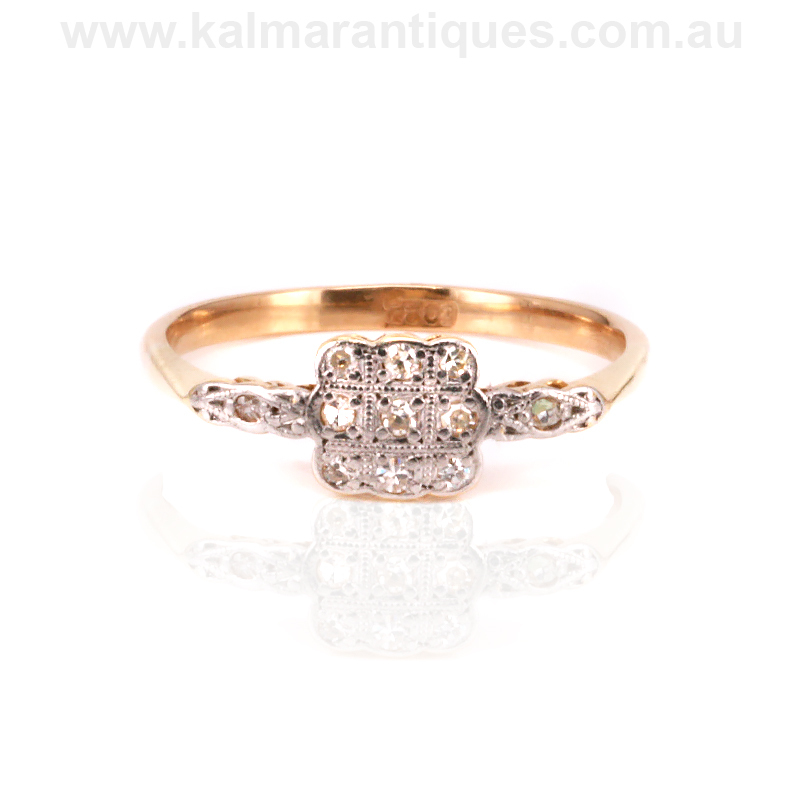 Perfect for an engagement ring, this is such a sweet and charming Art Deco diamond ring that will always be treasured. Tags: Art Deco diamond cluster engagement ring, Art Deco Diamond Engagement Ring. Art Deco engagement rings are more popular now than ever before. With the Art Deco period from the 1920’s until the 1940’s, the desire by women the world over for a genuine Art Deco engagement ring has never gone out of style or fashion.